What makes Noion a high performance multi-functional grease? Noion is based on a polymer compound with an optimised crystalline amorphous balance. It consists of combinations of polypropylene and rubber in synthetic oil, resulting in a non-ionic product with controlled oil separation that can be topped off with a wide range of additives. Noion greases have been shown to have much longer grease life in test rigs at 120°C than other greases under the same conditions. SKF R0F L50 values of over 5000 hours and FAG FE9 F50 results over 1500 hours are not uncommon. The non-polar nature of the product allows corrosion inhibitors to work effectively and to create a long lasting barrier against water and process fluids. Polar fluids and surface active components have a very small effect on the function of the grease as they cannot be blended into the grease matrix. The very good performance in cold chamber testing depends on the ability of the technology to control oil bleed. Noion provides the opportunity to have sufficient oil bleed at low temperatures, where most soap-based greases have stopped releasing oil. The reduced running temperatures and torques experienced from test rigs and field trials are a result of the product’s adaptability to the running conditions. In the contact zone of the application, the grease forms a regenerating lubrication film with in-situ friction modifiers that reduce friction and running temperatures. An example is the R2F-A test where the self-induced temperature is lowered 10-15°C compared to soap-based grease formulated with the same base oils. Noion greases have the unique ability to adapt the lubricating film thickness to a wide range of speeds, and even varying speeds. 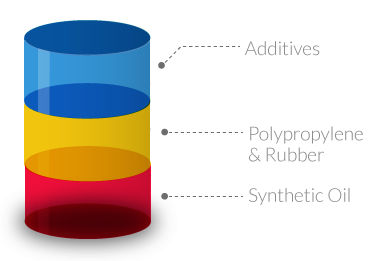 Different velocities apply different shear to the polypropylene thickener, resulting in lower or higher dynamic viscosity of the product. Thus, slow applications will have a sufficient film thickness since the polypropylene is not sheared down to the same extent and the opposite applies to fast applications. Traditional greases are thickened by soap that can and will be involved in the tribochemical reactions occurring in a machine element. The soap in some cases can bring desired properties to the lubrication but in most cases the soap will have a negative effect on the function of the additives. The thickener in a polymer grease is very similar to the base oil in its physiochemical properties and is therefore less likely to interfere with additive performance. In a world where the demands on performance are constantly getting tougher, NoioN is a giant leap forward. Which component wins the race to react with a metal surface? In a soap-based grease, the soap will almost always win over the additives because of its higher polarity. The same goes for a functional soap, even if the situation is improved by having the additives bundled together with the soap. NoioN works the other way around. Since the polypropylene is non-polar, the additives will easily reach the metal surfaces. This makes it possible to use a lower dosage of additives for the same effect, and thereby improve lubricating performance. Or you can use the same amount of additives and improve the required functionality, for example, resistance to corrosion. In addition, the inert character of NoioN allows it to work with most oils and additives, which is not the case with soap-based thickener systems. Based on a non-polar thickener system (polypropylene) – the additives can reach the metal surfaces and do their job. Soap and additives are bundled together – more additives will reach the metal surfaces, but some will inevitably be blocked in the middle. Soap has a higher polarity than additives – many additives will never reach the metal surfaces.